In combination with the adapter, a great fit to the Rectangle Beam, SBW1W, 447nm Spartan which I purchased in 2011. The materials, threads and finish are of high quality. The beam is definitely more focused so the device does what it is advertised to do. I would recommend purchase if you are looking for a tighter beam. The 2x beam expander works great on my spartan laser the construction is solid and the flat black finish looks great. Its easy to use and has a ring in the middle to hold the focus amd with the two end caps it helps keep the dust off the lenses i will probably buy two more dragonlasers did a great job on this product. This is an awesome attachment for my Spartan blue 1 watt laser. It allows the me to focus the laser to different distances and expands the width of the laser beam as it leaves the lens. Making an awesome laser even more stunning! 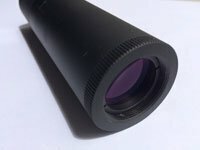 I eagerly awaited the arrival of my new x2 beam expander for my spartan 1w blue laser, but sadly on arrival and first testing I sadly discovered that my laser was not 100% aligned with the center of the lenses. This meant that I couldn't focus the beam properly and now I just have an expensive and useless attachment on my laser. This will most likely not be the same story for most other people but just be warned, in case you have high expectations like I did. Good product, does the job. Easy to use, extended my Spartan's ability to burn to a distance of 9 meters. It's a pity the Beam Expander is only X2. All in all, I am satisfied with the purchase. I dont know why your beam expander is only 2X when everybody else sells a 10X, unit expecially when you just changed it to the new generation model. The new one works fine, but given a choice i would of preferred the 10X. the beam expander perform considerably the laser, it makes a tight beam as far as you can see, my spartan 1 watt beam have better divergence, now I can see a little dot when before I saw a rectangle .